Lighthouses are archaetectural wonders combining practical purpose with aesthetic appeal, offering a beacon of hope for mariners on dark and stormy nights. These towering structures are iconic of the coast and may also provide romantic and picturesque places for weddings, combining the appeal of these unique old buildings with surrounding coastal scenery. Lighthouse weddings can ensure that the wedding day will be one to remember with fondness. Buchan Ness Lighthouse, built upon a headland on the coast of Aberdeen in North West Scotland, was constructed in the 1830s by renowned engineer Robert Stevenson who also chose the site of construction. Lighthouse weddings in this destination occur within the lighthouse keeper’s cottage and should prove to be an unforgettable experience for all involved. The coastal headland of Dungeness in Kent has been the site of five successive lighthouses and lighthouse weddings are available in the decommissioned Old Lighthouse. This structure, built between 1901 and 1904, is forth in the the series and couples may opt to ride the light RH&DR Romney Railway to the site, the line having been extended to this location in 1928. This beautiful old lighthouse, on the coast of Glamorgan in the South of Wales, was built in the 1830s to architect James Walker’s design and remains a recognizable part of the Welsh coastline. The lighthouse is still operational although it transitioned from manned to automatic control in the 1990s. 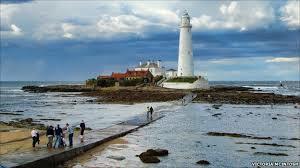 Today this grade II listed building is available to hire for lighthouse weddings. St Mary’s Lighthouse, in Whitley Bay in the North East of England, is built upon an island that is only accessible at low tide by a causeway. This tall white building, built in the 1890s, dominates the local landscape and stands as an symbolic landmark of this maritime town. Today the lighthouse is operated by the local council and is available for wedding hire, providing an excellent setting for nuptial ceremonies. West Usk Lighthouse, built to the design of architect James Walker in the 1820s, resides by a joining of the Severn Estuary and the River Usk. During its operational life this lighthouse was trusted to protect shipping traveling inland and out to sea. Now decommissioned, this Grade II listed building has found new life as a hotel and is a popular place for weddings. The Eddystone Lighthouse is located on the Eddystone Rocks, around 14 miles southwest of Plymouth in Devon. Over the years, there have been five lighthouses protecting the Eddystone Rocks. From land, the most recent incarnation of the Eddystone Lighthouse can only be seen on a clear night. The cliffs around Polperro, Talland and Looe offer the best chances of catching a glimpse. What has now become Devonport Naval Dockyard was established in 1690. 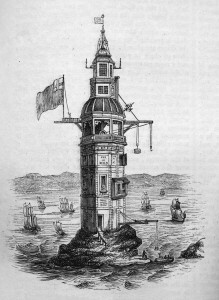 Upon recognising the danger posed by the Eddystone Rocks, King William III commissioned Henry Winstanley to design and build a lighthouse. Construction started in July 1696, however it was not until 14 November 1698 that its first light was lit, when it became the first off shore lighthouse in the world. As this early lighthouse was constructed from wood, it did not fare well over the winter months, and had to be virtually rebuilt the following year. The second incarnation was a strengthened and enlarged version of the first and stood until 1703, when a hurricane hit, sweeping away not only the lighthouse and its keepers, but also Henry Winstanley, who was working on the building at the time. 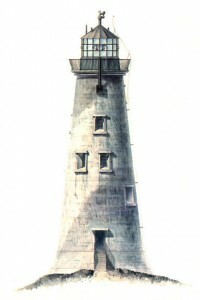 In 1908, John Rudyerd began construction of a third lighthouse. Compared to its predecessors, it was much more streamlined, being narrow to lower resistance and ballasted at the base with stones. It lasted 47 years, until one night in December 1755 the candles in the lantern set light to the roof. The three keepers at the time were rescued the next day, however one died 12 days later having swallowed molten lead from the burning roof. Construction of John Smeaton’s take on the Eddystone Lighthouse began in 1756, taking three years to build. It was constructed from granite blocks with dove tail joints, using quick drying cement to hold it together. This was extremely effective, and soon became the standard way of building lighthouses across the world. It was so effective that it had to be deconstructed 127 years later due to the rock it was sitting on showing signs of stress. It was moved and re-erected on Plymouth Hoe, thanks to funds raised by the people of Plymouth. The fifth Eddystone Lighthouse was designed by James Douglas, with construction completed in 1882. It has had several updates over the years, being changed from oil burning to electric in 1956, having a helideck added in 1980, and being converted to an automatic operation in 1982. One of the UK’s oldest charities, the Corporation of Trinity House was granted a Royal Charter by Henry VIII in 1513. The organisation has been concerned with the safety of shipping and the well-being of seafarers throughout its history. Today, it acts as a charitable organisation dedicated to the safety, welfare and training of mariners. Trinity House began as a charitable guild and was based at a great hall close to the Naval Dockyard on the River Thames. In 1604, the guild was given rights related to compulsory pilotage of shipping by James I. It was also conferred the right to licence pilots on the River Thames. In later years, the organisation served as the Pilotage Authority for London and more than 40 districts across the UK. With the 1987 Pilotage Act, responsibilities for direct pilotage were transferred to local port and habour authorities. Today, the organisation includes approximately 300 members including leaders in the Royal Navy, Merchant Navy and the shipping industry. Trinity House serves as the General Lighthouse Authority for England, Wales, the Channel Islands and Gibraltar. As such, it provides over 600 aids to navigation including lighthouses and a satellite navigation service that assist with the safe passage of vessels through some of the world’s busiest sea-lanes. It also inspects and audits more than 10,000 aids to navigation provided by local port and harbour authorities in the UK, as well as similar aids on offshore structures. The first lighthouse built by the charity was in 1609 at Lowestoft. Many lighthouses in the UK remained private until 1836, when all private lighthouses in England, Wales and the Channel Islands became managed by the charity. It also marks and disperses wrecks when they pose a danger to navigation. As a charity, Trinity House offers a range of services for mariners and their dependents. When it was granted its first Royal Charter, the charity guild maintained almshouses for aged mariners and their dependents at Deptford. More recently, the organisation operates 20 retirement homes in Kent. It also offers its Merchant Navy Scholarship Scheme, which provides financial support for youth interested in pursuing careers as officers in the Merchant Navy. The organisation also acts as a Deep Sea Pilotage Authority and licences Deep Sea Pilots. In this role, it provides expert navigators for ships that trade in the waters of Northern Europe. Although not mandatory, deep sea pilots are particularly helpful for ships with masters who are not familiar with waters they are travelling across.